The very title of Chance The Rapper’s third mixtape, Coloring Book, seems to invite some level of audience interaction. The mixtape has only been streaming on Apple Music since last Thursday, and already it has inspired an interesting and ambitious song-by-song reimagining. Specifically, a teenager named Jacob Brody, who like Chance hails from Chicago, has unveiled his 57-minute guitar cover of Coloring Book. Brody overlays his own, newly devised guitar part over the existing mixtape. He doesn’t showboat, however, and allow himself to drown out the original recordings, which have drawn praise for their rich, gospel-tinged sound. Brody is a team player, even if the rest of the team recorded their parts at an entirely different time and place. His bluesy guitar riffs simply add a little extra flavor to a set of already solid songs. What’s remarkable is that Brody’s version of Coloring Book was done in one take. Or, rather, a series of single takes. His camera, as he explains in the video’s description, only allows him to record 20 to 25 minutes at a stretch. Nevertheless, the emphasis here is on improvisation and fluid, in-the-moment musicianship. The YouTube video accompanying Brody’s guitar cover seems to exist only to prove the veracity of the musician’s “one take” claim. Aesthetically, there’s not much to it otherwise. 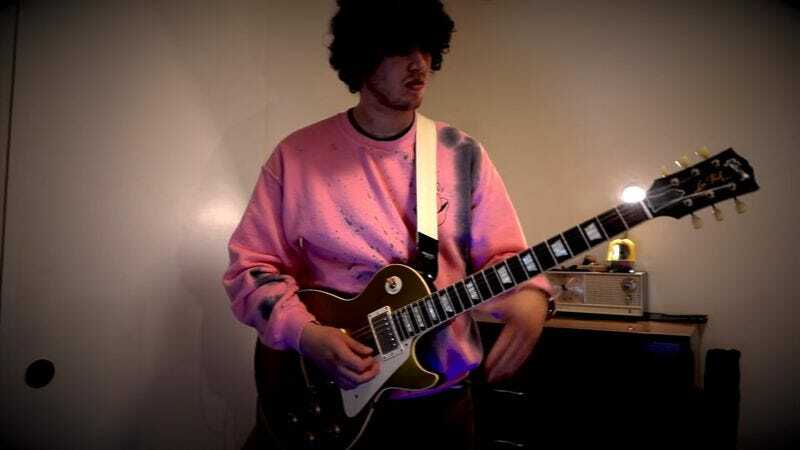 Clad in a baggy pink sweatshirt, the hirsute Brody spends most of the video looking down at his guitar as he plays. That’s about it. The room where he’s recording seems to be sparsely decorated and lit only by a single lamp, so there’s not much in the way of visual distraction here. What matters here is the music, and Brody has wisely made this available in audio-only form at his SoundCloud page.